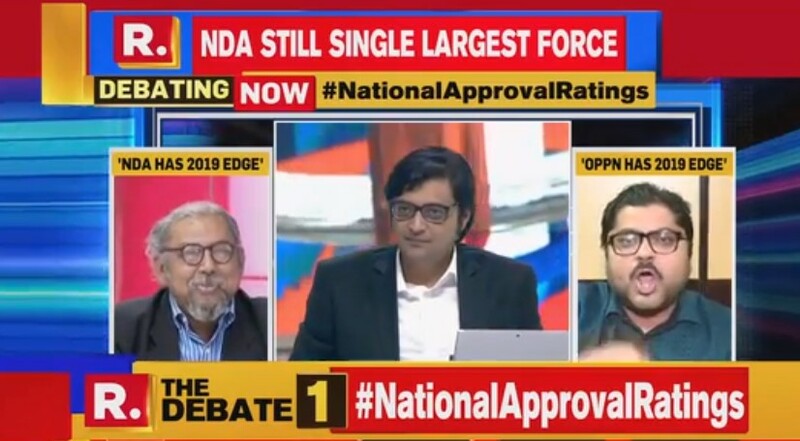 Arnab Goswami’s Republic TV has become notorious for turning prime time debate into noisy drama as panelists often go berserk in outsmarting each other with their verbal diarrhea. Only last week, Alia Bhatt’s mother Soni Razdan had explained how viewers had deserted channels such as Republic TV and Goswami’s former channel Times Now in favour of those that did not allow their prime time to be turned into noisy hours. Last week, Republic TV became a topic of yet another conversation for the wrong reasons after its panelists decided to do away with the language of the channel, English, and launched all-out attacks against each other in their regional languages. It all started with BJP’s Gaurav Bhatia attacking Trinamool Congress’ Garga Chatterjee in Hindi on an English channel. Chatterjee, who’s spoken about his abhorrence to Hindi in the past, took to Bhatia’s act and launched a tirade against the BJP spokesperson in Bengali. He asked, “How dare you speak to me in Hindi? If you speak to me in Hindi, I will speak to you in Bengali.” Continuing his attack, Chatterjee also mocked Bhatia for being a turncoat and switching his loyalty from the SP to the BJP. What appeared to irk the Trinamool spokesperson was how Bhatia had attempted to mock the way in which the West Bengal Chief Minister Mamata Banerjee’s name was pronounced – by using a fake Bengali accent. As Chatterjee and Bhatia attacked each other in their respective languages (read Bengali and Hindi), psephologist Yashwant Deshmukh joined the debate by commenting in bhojpuri, a dialect widely spoken in eastern Uttar Pradesh and most of Bihar. The scene turned uglier when BJP-leaning journalist Kanchan Gupta made his own intervention in Bengali. Addressing Gupta disparagingly, Chatterjee called him a ‘delhi boot-licker’ and third-rated Lutyen journalist. In response, Gupta accused Chatterjee of being impolite and uncivilised as he objected to be addressed in a disparaging manner by the Trinamool spokesperson. And if this had not added the much-needed entertainment quotient to the show, a TDP spokesperson joined the debate by speaking in Telugu. I stopped watching Republic News Channel..too much noise and less substance.. Believe me indirectly you are promting republic tv and forcing readers to take a look at their channel subsequently leaving yours. Lol, grow up man. This useless channel republic TV projects Arnab Goswami as the great anchor.Instead of being a moderator he gives judgement and dictates the way.He is a great cunning person with a big begging bowl in his hands.